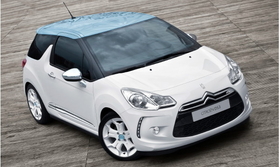 The DS3 is the first of Citroen's three-car near-premium range. Citroen has released pictures of its new DS3 ahead of the car's debut at the Frankfurt auto show. The DS3 will be the first model in Citroen's planned three-car near-premium range aimed at giving the French brand an image boost. Cars in the Distinctive Series range will carry the legendary DS badge, made famous by Citroen's iconic executive sedan during the 1950s, '60s and '70s. Based on the C3, the DS3 will rival BMW's Mini and the Fiat 500. It will go on sale in March, priced below the Mini, which starts at 15,200 euros in Germany. A DS4, based on the C4, and DS5, based on the C5, will follow in 2011. Citroen says higher design and performance standards will set the DS cars apart from the rest of the brand's range. The carmaker is aiming to squeeze extra revenue and higher margins out of its near-premium line. Citroen also wants to add more sales volume to the mainstream models on which the DS-badged models are based. The DS3 will be offered with three gasoline engines, which Citroen co-developed with BMW, and two diesel engines. The diesels will have CO2 emissions of 99 grams per kilometer and 115g/km, while the gasoline units will emit between 136g/km and 160g/km. Citroen says the car has a large trunk capacity of 285 liters despite being one of the smallest cars in its class with a length of 3950mm, width of 1710mm and height of 1460mm.